Fresh Dungeness crab leg sections for sale online and delivered to you. Dungeness crab sections are a cluster of the crabs legs. Order Dungeness crab leg sections online and enjoy this delicacy in the comfort of your home. Clicking the buttons below will open a new window with the full description of the Dungeness Crab leg sections for sale at Amazon. Found of the Pacific coast of the United States and Canada, the Dungeness Crab has very sweet and delicate meat. It is named after the town of Dungeness, Washington which is located in the Straight of Juan De Fuca, which separates Washington State from British Columbia. The Dungeness Crab is perfect for any crab lover, especially those who have a taste for crab cakes. 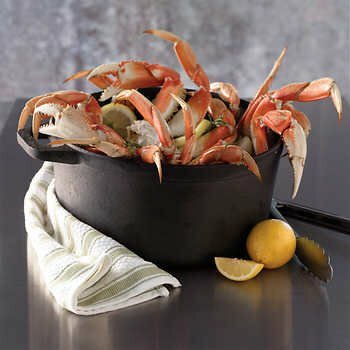 The legs, claws and body contain some of the best crab meat to be found in the world! Just remember, you will need a crab cracker and a shrimp fork to get to it! Details: 5-8oz clusters. 20-32 Crab Clusters Per Order (10-16 whole crabs worth) Note: May Contain up to 10% Segmented Legs. Blast Frozen. Caught In Oregon State. Trident Seafoods Dungeness Cooked Frozen Crab Sections Cluster, 10 Pound - 1 each. 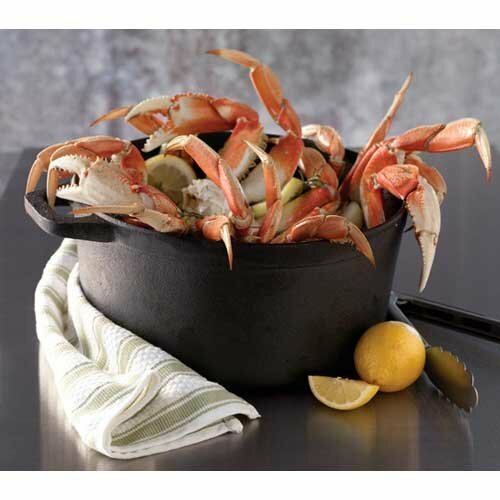 Trident Seafoods Dungeness Cooked Frozen Crab Sections Cluster, 10 Pound -- 1 each. Fully Cooked, Ready To Use Low Labor Cost, Less Waste Premium Seafood Product Available Year round Consistent Menu Price Low Fat, High Protein Attracts Health Conscious Impressive Plate Presentation Signature Menu Item Brine, Not Blast Frozen Meat Releases From Shell Easily Clean, Bright Shell Exceptional Appearance. Remove All Packaging and Refrigerate Below 38 F For 8-10 Hours or Overnight.